Whether you are looking for a contractor for your paving project, or just looking for some advice on asphalt repair or asphalt maintenance, we got you covered. Asphalt 101 is your one stop shop for information on everything from qualities to look for in a contractor to preventative steps that will help you maintain your asphalt pavement. This guide offers advice for all different types of asphalt pavements. We want to help you protect and maintain your asphalt with knowledge we've gained from being in business for more than 75 years. 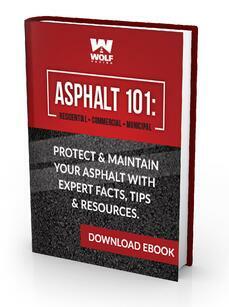 In our Asphalt 101 eBook, we outline all of the important facts you need to know, whether you are a residential, commercial or municipal client. How do you increase the lifespan of asphalt? Why kind of care does asphalt need? These questions and more will be answered in our eBook below. Download now! With more than 75 years of asphalt paving experience, from highways to driveways, we are your local source for all of your asphalt paving needs.